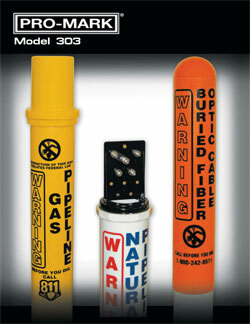 The PM-303 Dome Marker is a Cable and Pipeline Marker used as a Warning Sign to mark underground utilities. The PM-303 is a Right of Way Marker used to mark the following utilities: Fiber Optic Cable, Gas Pipelines, Petroleum Pipelines, Electric Lines, Water Lines, Sewer Lines and all other buried utility lines. The PM-303 is molded from specially formulated resins with UV inhibitors. It's 360 degrees cylindrical shape insures that the Dome Marker can be seen from all angles on the ground and by air patrols. Unlike decals, the ProMark graphic system has a lifetime guarantee not to fade, peel or chip. Graphics are customized to meet customer specifications and U.S. Department of Transportation regulations. Our Marker is environmentally friendly and is 100% recyclable. The PM-303 Dome Marker is resistant to chemicals and has high impact resistance making it the safest and most durable way to mark underground utilities. The Dome Marker is 3.5” in diameter and is available in all standard lengths, colors and comes complete with anchor bar. The Marker is also available with a PM-TS3 Test Station or Vent.